Skripunov Alexey is enchanted with beauty of the ancient architecture of the Moscow Kremlin, and has depicted this subject in his work. 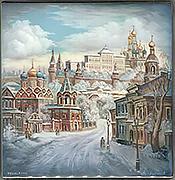 Here the artist has painted a magnificent view of the Moscow Kremlin that can be seen from the old town. In the background we can see the Borovitskaya and the Vodozvodnaya Towers of the red-bricked Moscow Kremlin wall. In the background the artist has painted the Great Kremlin Palace, and fragments of the Belfry of Ivan the Great, the Archangel Cathedral, the St.-Basil's Cathedral and the Spasskaya Tower.On the foreground we can see old two levels houses and small churches. The box is made out of paper-mache. The box's exterior is black, while the interior is traditionally covered with red lacquer. The lid is hinged from the top of the scene and the box rests flat. The work is signed with the artist's name and Fedoskino.